Ironically, after returning from Europe and seeing the Van Gogh collection in Paris and Amsterdam, the National Gallery of Victoria decided that their next winter exhibition would be on Van Gogh. Well, I guess you can't get too much of Van Gogh (even though I have already written two posts on the guy). So, even though I had seem a number of his works (though I have yet to see Starry Night, which I believe is in New York), I decided that it wouldn't hurt to go and see another exhibition. Well, it turned out that I wasn't the only one who had that idea, though I probably shouldn't be all that surprised when it comes to Van Gogh. Also, since it was on a weekend it was also going to be quite problematic. Unfortunately the short amount of time that I have for lunch wouldn't accommodate the tram ride to the museum, a quiet flutter through the exhibition, and back to work (and I suspect that the quick flutter would have been something like five or ten minutes). So, I suspect I spent something like an hour in line, and when we actually got into the exhibition we were jostling through hundreds of people. Still, I was able to experience the exhibition. Basically, as the name suggests, the exhibition is about the seasons. However, the concept of the season is more than simply the seasons of the year - it can also reflect the seasons of one's life. When he was in the Hague, Van Goth explored the idea of the seasons of life through a series of works, particularly looking at the common man. This was something that he would take through his own life, and develop as his art developed. I would say that the exhibition opened with the engravings, but with most of these exhibitions it opened with Van Gogh's life. Well, I have already written on his life, and his madness, so I won't repeat myself here. Anyway, the exhibition basically breezed through that as well, though most of the people who came to the exhibition probably know little about Van Gogh's life other than the fact that he was a painter, he cut off his ear, and that he wore a straw hat (oh, and had a beard). However, once I had passed that brief introduction (and basically skipped the introduction video), I came to the first part of the exhibition - the engravings. During his time in the Hague, and earlier, Van Gogh would collect images and engravings that inspired him, and hang them on the walls of his studio. These he would reflect upon as he developed his art. In fact his art tended to move with his own mental state at the time, meaning that during his religious youth his art would have a distinct religious flavour. Anyway, a number of these engravings were on display - it should be noted that that these are actually prints, and not the original engraving. Engravings were a method of mass producing art, and these were only copies as opposed to the original. Sticking with the theme of the seasons, each of these engravings represented one of the seasons (though there were quite a few of these engravings on display). This is The Sower by Clement Bellenger. The sowing season begins around April, at a time when the weather conditions are ripe for crops. During winter it is obviously not a good time to have seeds in the ground as it tends to be covered in snow, so this was set during the spring, after the frost has finally dried and the rains are started to appear. No doubt the seasons are different in other places where it doesn't snow (such as Southern Europe and Australia). This engraving is called 'A Winter's Morning' by Edward Duncan. While the image is black and white, it still portrays the bleak and dreary nature of a European winter. The sheep are huddled together for warmth, and the trees are bare. The sky is also quite bleak and cloudy, and smoke plumes rise from the huts in the distance. This is the life of those who are on the land. Another engraving by Edward Bellenger, this one is called The Potato Harvest. Notice how we aren't looking at the aristocracy or the wealthy middle class, but peasant women performing backbreaking work. The artists of this time are reminding us of the people who work hours on end simply to put food on our table - their roles are just as important as those of us who sit behind desks, and in a way more so, yet they don't seem to be appreciated as much. It makes me think of some of our prayers where we thank God for the food on our table as if it magically appeared there, and pay little head to the farmers to spend their lives making sure that we are fed. This is called Thrashing by Charles Emile Jacque. Like the others we once again see peasants hard a work creating the bread that will sooner or later appear on our tables. Okay, things aren't done this way anymore, but this is something that many of the modern artists were exploring - the hidden people that exist behind our comfortable lives. In many ways this type of work is viewed as being unskilled, manual labour that anybody can do, yet it is work that is back breaking and incredibly tiring. The artist no doubt were paying homage to these ordinary people. When Van Gogh arrived in Antwerp he discovered the beauty of Japanese art. In fact the docks of Antwerp were swarming with examples of Japanese woodblock prints. Japanism, as it was called, was very popular among the artist world at the time, and it was something that would influence Van Gogh for the rest of his life. When he moved to Paris he began to look around him through the eyes of the Japanese artists, and upon leaving Paris for the country, he began to view colour differently. In a way, it was the works of the Japanese artists that had the greatest influence on Van Gogh' work, and he even collected up to 500 Japanese engravings, which are now on display in the museum in Amsterdam. This piece is by the Japanese artist Hiroshige and is called Mount Fuji from the Fields. The following pieces are examples of the Japanese art that inspired Van Gogh, and are all on display at the National Gallery of Victoria. Notice the vivid colours of this piece, and the flowers almost taking our eyes off Mount Fuji in the distance. This work is called Washing by the River which is also by Hiroshige. Since the exhibition was about the seasons, the Japanese collection was also divided into seasons. This artwork was painted during the autumn, and like the engravings, shows ordinary people going about their daily business. Once again it also shows the difficulties of the period since they did not have modern conveniences such as washing machines. Another work by Hiroshige, this one called Gion Shrine in the Snow. No doubt this work represents winter, and here we have the women scurrying about as the snow falls and the cold begins to bite. While I'm not all that knowledgeable with Japanese culture, it certainly seems as if these women are not dressed for the snow. However, even though the snow covers everything, the colours still stand out, particularly of the woman's clothes. Even in the heart of winter is colour still noticeable. Well, I probably shouldn't be surprised that even in Japan during the heat of summer we will find people down at the beach, and even swimming in the ocean, as this work by Hiroshige called Seven Mile Beach shows. Actually, I assumed (quite wrongly obviously) that the tradition of going to the beach and going for a swim was only something that us moderns did, but it seems that people have been looking for ways to cool off for centuries. However, it is noticeable that the people in this work do seem to be of the upper classes. So we now return to autumn with Eisen's Plum Garden in Edo. The seasons change, but in a way they always go in a cycle. The heat of the summer has gone, and people are now preparing for the winter. The trees have lost their leaves, and everybody is hurrying about making sure they are stocked up. The wind is beginning to bite, and once again we are back to where we started. Van Gogh's favourite season was said to have been autumn, no doubt because of all the bright colours in the trees and the that leaves slowly fall in preparation for winter. However, even though he may have preferred autumn, he found beauty in all of the seasons. Yet, whenever autumn approached, Van Gogh would get excited at the arrival of the vivid colours. He noted that while the old masters seemed to ignore autumn, many of his contemporaries indulged in its beauty. During this time Van Gogh would wander through the tree lined streets, and many of his paintings, particularly the still lifes, would reflect the fruit of the harvest. 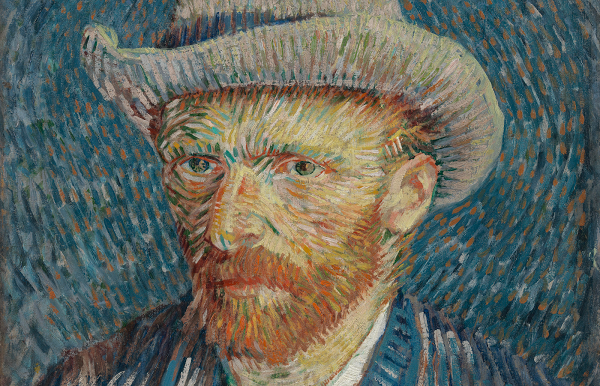 As such the NGV decided to begin their exhibition of Van Gogh's art during the autumn. This is one of Van Gogh's earlier works called 'A Shepherd and his Flock'. He would spend time wandering through the country and took particular interest in the people around there. Once again we have the forgotten people being brought to life through the art of Van Gogh. The painting not only represents the Autumn, but also the hard working tendency of the Dutch people. Yet the darker and gloomier nature of this work is in contrast to many of Van Gogh's later works. Van Gogh has intended to send a batch of these paintings to Paris, yet his brother Theo believed that due to their dark colours they would be hard to sell. Thus we now come to some classic Van Gogh with a painting called 'Pine Trees at Sunset'. This was painted during his time at the asylum in St Remy, and was painted six months before his death. Van Gogh had a special fascination with pine trees, seeking to capture their spiritual and anthropomorphic nature. The trees that had been battered by the Autumn winds, no doubt a reflective of his state at the time, a man who had also been battered by the harsh winds of life, and looking as if winter was closing in ever more. 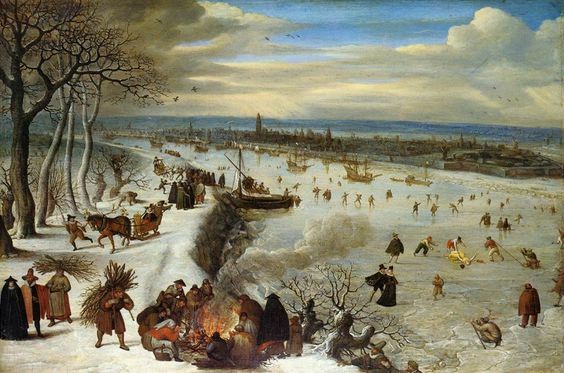 Winter is generally considered to be harsh and inhospitable, and in many cases is portrayed as such (though not always, as was the case of the painting where Schedlt froze over and children were skating on the ice). Yet Van Gogh never saw such things as cut and dry - there were layers to the seasons, even seasons as harsh as the winter. In a way the winter represented a world asleep, blanketed by snow, with the promise of a new dawn, and new life just around the corner. In a way it is a part of the cycle, a cycle that constantly renews itself. This is called 'Snow Covered Field' and is actually a copy of a painting by Millett and was done when Van Gogh was in St Remy. The thing with this copy that is Van Gogh sought to add some colour. Many artists simply saw the snow, and the winter in general, as a blanket of white with skeletal trees and frozen paddocks. However Van Gogh looked beneath this illusion to see life, and colour in this dreary landscape. Notice how the farming tools have been left buried under the snow - there is more to this winter landscape than snow and frost. I just noticed that there wasn't a huge collection under the winter section, though that may have had something to do with the paintings the NGV was able to get their hands on. However, they did talk about a painting similar to the above, called 'Miners in the Snow'. Once again we see Van Gogh looking at the working class, and the harsh life that they live. Mining has never been an easy job (though these days is quite profitable), and the harsh nature of the profession is exacerbated by the harsh climate that we see in the winter. The winter is over and the new life that is the spring time is beginning to show itself. In a way the spring is a symbol of a new beginning and of a new life. Yet in the early years Van Gogh still used his dark hues to create his spring time works. It could be suggested that while the new life was coming about, the darkness of the winter months had yet to be banished. However, when Van Gogh moved down to Arles, this was just before the beginning of the spring, and it was a time when some of his more famous works were produced. He also wanted to experiment with the trypich, a three panel work which was reflective of his religious influences from his younger days (and there is something that you do see in quite a number of museums and churches around Europe). The above is another one of Van Gogh's peasant paintings from his earlier years. He preferred to wander around the fields and use real peasants as his inspiration as opposed to models from other areas. Then again Van Gogh was never one for painting from his imagination. During his earlier years, when he was exploring the world of art, he would wonder around the fields, and studied the life cycle of the far. When he took Antoon Hermans, a wealthy amateur painter, on as an apprentice, he was commissioned to decorate his house, and Van Gogh's suggestion was to have a painting representing different seasons on each of the four walls of the dining room. However, these paintings went missing after Herman's death. The above is called 'Tree Trunks in the Grass' and was the first painting that he painted after coming out of isolation from the asylum in Arles. Basically he had locked himself away due to his inability to deal with the outside world, and I have to admit that I do sympathise with him - the outside world, and other people, can be very difficult to deal with at the best of times, and while there are some people who thrive upon human contact, there are others, like Van Gogh (and myself) who at times want to keep it to a minimum. The interesting thing about this painting is that it is a close up of the group, and much of the scene is actually cut away so as to only focus on this part of the view. While in Arles, Van Gogh went for a trek south to Saint Marie de la mer (Saint Marie on the Sea). While he was only here for a short time, he used this time to reinforce the beauty of the Japanese wood carvings that he so loved, as well as capturing the vivid colours of the region. In a way this trip inspired him somewhat, and that is what I've noticed that travel can do - inspire us - since it takes us out of our dreary day to day live and into another world. Van Gogh wasn't the first to see the idea of the cycle in wheat, and that summer, the time for harvesting the wheat, as being a high point of the year. This idea of the cycle has been with us since ancient times, and even appears in Christianity, which Christ comparing his death and resurrection to the wheat having to die to produce seeds to bring about a new crop of wheat, and the bread forming the centre piece of Holy Communion. However, Van Gogh also saw the world in terms of colours, and saw the summer as being a contrast of deep blues with the gold and orange of the swaying wheat fields. As for the workers in the fields, he saw something unique, and vivid, about them - they are performing an essential function in harvesting the wheat so that it may be turned into bread. This no doubt continued to impress upon him as he moved into regional France to areas such as Arles, where he continued to witness the cycles of the seasons culminating in the harvests of the summer. The above painting has an almost religious significance. It is the culmination of the labourer's work - the production of the wheat that has been collected and brought together, ready to be taken back to the mill for processing. However, it is not just the results of the fruits of one's labour, but also a blessing from God, the fruit of the Earth, which will eventually become food that sits upon everybody's table. That simple loaf of bread that is handed out at restaurants is actually the product of days, weeks, and even months of work. The interesting thing about the above painting, which was painted in Arles, is that almost half of the painting is taken up by Earth and stubble. This is one of Van Gogh's major themes, that of the wheat field, but not just that but also the harvested wheat, which is the end product of the cycle, where the land has been fruitful and have brought forth its crops. Here the wheat is wrapped up and ready to be shipped off. For the final painting, what best to look at Wheatfields and Cypress, which was the main piece advertised by the exhibition. This was painted in 1889, after Van Gogh had been released from the asylum for a short time. Here he discovered a new focus of his art, the evergreen cypress. These trees were planted to protect the fields from the elements, however Van Gogh saw them as imposing figures, almost like an Egyptian obelisk. These trees subsequently appear in many of his other works, including Starry Night. Yet notice the beauty of this work, the contrasting colours, and the waves of the clouds and the fields. This work captures an image that is truly only Van Gogh's view of the world, an almost romanticised world of colour and beauty, where the ordinary takes on a much more prominant role, and has an almost religious significance. Nice to see all those inspirations. You can definitely think of paintings that were taken directly or indirectly from those other works. I am a Van Gogh fan, and enjoyed your perspective. I believe I saw Starry Night a half decade ago or so at the De Young in San Francisco - they had two shows a year apart on the impressionists. Most of the stuff was from the D'Orsay, but there were others on loan from elsewhere. I was not particularly familiar with either of the Pines one or the Tree Trunks that you posted. Very nice. Always good to see something new.